Even though the topic of employees’ washroom rights isn’t something that’s usually discussed, it is important for every worker to know their rights. With that in mind, here are some things related to the topic of washroom rights that every employee should be aware of. Every workplace must have a washroom for the employees (except if your work includes constant travelling between different locations). If you’re working at one location, like in an office, then your rights about having a washroom available are pretty clear. Your building must have a washroom facility you and your colleagues can use, and it must have both a toilet and a basin for you to wash your hands. For example, if a school is your workplace, here’s all you need to know about your school washroom requirements. However, if you are a part of a mobile work crew, then a washroom with all the necessary elements must be available within a quarter mile of your working site. The number of washroom facilities you should have depends on how many employees there are, regardless of their gender. In this section, the numbers are related to female employees, but they do apply in gender-neutral washrooms as well. Between 1 and 5 employees, 1 toilet and 1 hand-washing facility. Between 6 and 25 employees, 2 toilets and 2 hand-washing facilities. Between 26 and 50 employees, 3 toilets and 3 hand-washing facilities. Between 51 and 75 employees, 4 toilets and 4 hand-washing facilities. Between 1 and 15 employees, 1 toilet and 1 urinal. Between 16 and 30 employees, 2 toilets and 1 urinal. Between 31 and 45 employees, 2 toilets and 2 urinals. Between 46 and 60 employees, 3 toilets and 2 urinals. Between 61 and 75 employees, 3 toilets and 3 urinals. Between 76 and 90 employees, 4 toilets and 3 urinals. Between 91 and 100 employees, 4 toilets and 4 urinals. We all have washroom-related needs, even at work. A study has shown that an average worker spends about 41 hours every year in the washroom. Every employee should be provided with a few breaks in order to be able to take care of their needs, freshen up, and regain energy. Washroom breaks are no exception here. This might seem like common sense, but it’s surprisingly often overlooked. In every workplace washroom, there should be both cold and warm water available as well as soap. Also, there should be either a hand dryer or paper towels for employees to dry their hands. In the workplace, taking take care of health and hygiene is essential. So, every employee should and must have access to hand hygiene facilities and supplies. 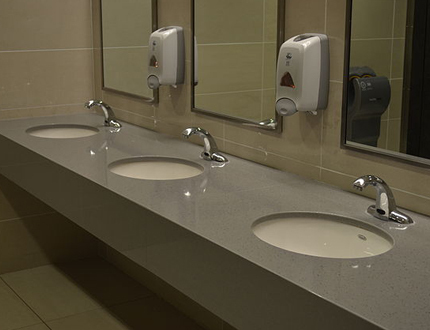 The way washroom is designed is extremely important, as it should be done appropriately. This has nothing to do with the quality of the facilities, but with the placement of the toilets. Needless to say, the toilets should be separated by a cubical and a door, so whoever is using them can have some privacy. This is a standard design for all workplace washrooms and there are no reasons not to follow it. All the washroom facilities should be cleaned every day, and the supplies (toilet paper, soap, etc.) should be checked regularly and refilled if needed. It’s also a good idea to clean up all the washroom facilities at the end of every workday. It might not be necessary but it’s highly recommended in order to ensure the cleanliness of the washroom. This includes mopping the floors, cleaning the toilets and basins, emptying the trash bin, refilling the soap, replacing the toilet paper, etc. In most workplaces, showers are not necessary. However, if you’re working in a lab with lots of chemicals that could be harmful or in a gym where people sweat a lot, then you should be provided with shower facilities (with both cold and warm water). In those cases, showing helps employees maintain their hygiene and safety. Unfortunately, in terms of washroom rights, there are some companies who do the very least, just enough not to get in trouble. They are only looking for ways to save money, but that is a bad way to do it. The washroom is not a place where you should try to save up, as it doesn’t really require much. Most of the things it does require are pretty much the bare necessities for maintaining the hygiene of the users. Plus, it is possible to provide your employees with everything they might need, from the facilities to enough breaks, and still spend much less money than you might expect. When it comes to saving money, one thing you could and should do is go green. If you choose eco-friendly options for your washroom, you’ll be able to use toilet paper made of recycled materials, natural soaps, and if you want to go one step further, even solar panels that can help you save money on electricity. There are a lot of benefits, and going green is not necessarily expensive. As the one in charge, it’s your job to ensure that your washroom is up to the highest standards. It’s not just about having a place to go when you need to go, there’s much more to it. If you truly do want to optimise your workplace and improve the productivity at your office, the best thing you can do is ask your employees what they would change. Talk to them about anything they might be unhappy about and see what you can do to solve the issues and make them happier. This way, you will create a much more positive atmosphere and boost your employees’ motivation as well as their respect for you and your company. The chances are, there probably is something they would change, even if it’s something small and seemingly insignificant. Some of the most common complaints are related to the washroom conditions, so do your best to improve your washroom as much as you can. Improve your washroom facilities, partner with Alsco. With our fully-managed washroom systems, you’re sure to have a clean, hygienic and well-maintained washroom for your workplaces. Contact us now!